Match Report: FC Barcelona are European Champions at Long Last! LONDON — It’s the kind of story that will be passed down through generations. It’s a story about patience, persistence, and perseverance; about a noble quest to attain what many believed was unattainable. In the end, it was a pair of Dutchmen who, having previously conquered the summit of football elsewhere on the Old Continent, were brought in to impart their deep wisdom and can-do attitudes, thus illuminating Barça’s path to the highest peak and satiating the title-starved wishes of not just a Club, but an entire city. Ronald Koeman’s goal, which came after 111 minutes of nail-biting, edge-of-your-seat football, came crashing down like an enormous tidal wave, levelling years of built-up frustration with a single, forceful event whose impact will be felt for decades to come. With the game seemingly headed for a penalty shootout, the 29-year-old central defender lined up his free kick and fired the ball straight through Sampdoria’s six-man wall, finding the net just inside the left post. As Koeman’s historic blast sailed into footballing heaven, it relegated the woodwork — the bane of Barça’s European Cup final defeats in Bern in 1961 and in Seville in 1986 — to little more than a footnote. But while Koeman’s on field heroics instantly became the stuff of legend, as the players and coaching staff leapt up and down and exchanged hugs in what can only be described as sheer elation, the team’s manager, Johan Cruyff, calmly got up from the bench and stepped over the railing and onto the field as if it were just another day’s work. Make no mistake, Cruyff, the brash yet sincere genius, is The Deliverer. It was Cruyff, and Cruyff alone, who had the willpower to change generations of hardened minds and instill in them a belief that winning is an attitude. He is the single biggest reason why Catalonia will wake up tomorrow morning in its happiest mood ever. 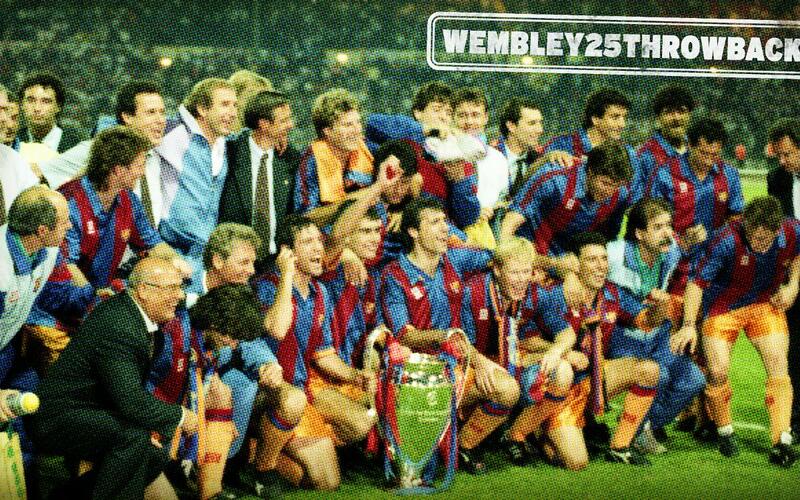 Though the contributions of Barça’s Dutch wonders cannot be overstated, they did not win this final alone. A supporting cast of bona fide stars did their part as well. This so-called Dream Team will go down in the annals of Barça history as the team that finally turned the corner. Goalkeeper Andoni Zubizarreta was one of the heroes, turning in another clean sheet with key saves time and again to keep Sampdoria off the scoreboard. One of the biggest came in the 22nd minute, when Zubizarreta made a reaction save on Attilio Lombardo from close-range. At the other end, one minute later, Barça forward Hristo Stoichkov, who would enjoy several scoring chances throughout the match, outjumped the Sampdoria defense, but his header was slapped away by Italian goalkeeper Gianluca Pagliuca. Barça took command in the opening minutes of the second half, but in the 59th minute it was Sampdoria who had the opening goal served up on a silver platter. Lombardo’s pass to Gianluca Vialli was a brilliant setup, but Vialli, who had only the keeper to beat, hit a first time shot just over the crossbar. In the 62nd, it seemed as if the post would once again spoil things for Barça, as Stoichkov took a brilliant through ball from Michael Laudrup and beat Pagliuca with a low shot only to watch in disbelief as it went square of the post. The final quarter hour of regulation ticked off. Then another 15 minutes of extra time. In the 111 minute, less than nine minutes from a penalty shootout, Sampdoria midfielder Giovanni Invernizzi was whistled for a foul on Barça full back Eusebio Sacristán, as the two battled for a loose ball 25 meters from the Sampdoria goal. The Italians were furious, and they inveighed against the referee’s call. As Sampdoria set up their wall, Koeman stood behind the ball, with Stoichkov to his right and José Mari Bakero to his left. The referee gave the green light. Stoichkov tapped it, Bakero stepped on it, and Koeman shot. The history of FC Barcelona will never be the same.